UPDATED: U.S. Rejects Assad's Timetable For A Chemical Weapons Deal : The Two-Way In Geneva, Secretary of State John Kerry said despite the difficulties, the U.S believes a deal is workable. The Syrian leader had offered to sharing data about his chemical weapons stockpile 30 days after signing the international treaty banning their use. In Washington, D.C., this week, there have been demonstrations both in favor of and against a military strike on targets in Syria. 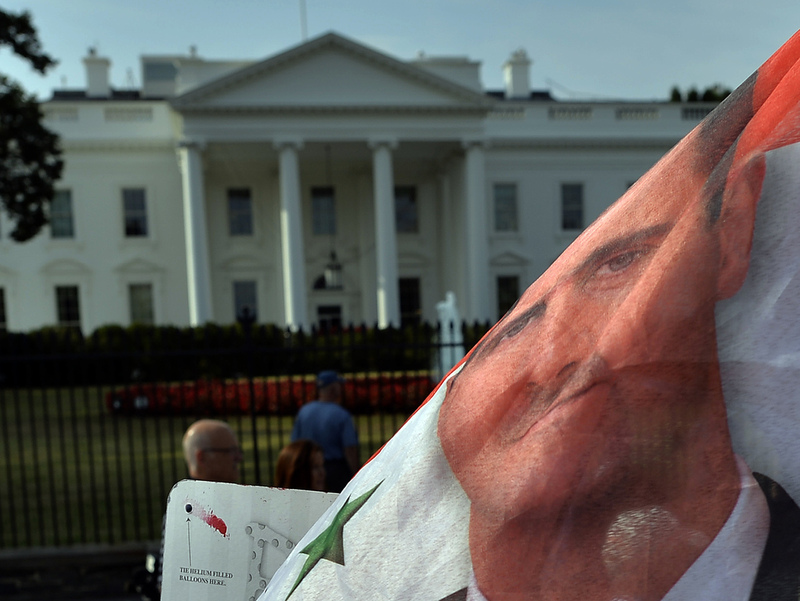 Outside the White House on Monday, supporters of Syrian President Bashar Assad waved a Syrian flag with his face on it. Thirty days after his regime signs the international Chemical Weapons Convention that bans their use he will start handing over data about Syria's stockpile, President Bashar Assad told a Russian TV channel Thursday. But Assad also said, according to the RIA Novoti new agency, that Syria will only fully fulfill its promise to hand over such weapons if the U.S. stops talking about possible military action against his regime and "ceases arm deliveries to terrorists." "It's a bilateral process aimed, first of all, at making the U.S. stop pursuing its policy of threats against Syria," Assad said, according to Russia's RT.com. By "terrorists," Assad means the rebel fighters battling his forces. As we said earlier, The Washington Post is reporting that "the CIA has begun delivering weapons to rebels in Syria." The commander of the Free Syrian Army, however, told NPR on Thursday that his fighters have not received any arms from the U.S. Whether Assad's timetable and conditions will be acceptable to the Obama administration, of course, isn't yet known. Secretary of State John Kerry is in Geneva today to negotiate with Russian Foreign Minister Sergey Lavrof. At the United Nations in New York, the Syrian ambassador said Syria had submitted and the U.N. had accepted the documents needed for the country to join the Chemical Weapons Convention, which compels signatories to destroy its chemical weapons stock. "Legally speaking Syria has become, starting today, a full member of the convention," Ambassador Bashar Jaafari said. A little after 5 p.m. ET., the United Nations said it received a letter from Syria saying Syrian President Bashar Assad had signed a "legislative decree providing for the accession of Syria to the Convention on the Prohibition of the Development, Production, Stockpiling and Use of Chemical Weapons and on their Destruction of 1992." "In their letter, the Syrian authorities have expressed their commitment to observe the obligations entailed by the Convention even before its entry into force for Syria. "The Secretary-General welcomes this development, noting that, as depository of the Convention, he has long called for universal accession to the Chemical Weapons Convention. Given recent events, he hopes that the current talks in Geneva will lead to speedy agreement on a way forward which will be endorsed and assisted by the international community." Right off the bat, during the first press conference Kerry held in Geneva, he rejected the Syrian timetable. He said that after what the Syrian regime has done, there is "nothing standard" about this process. "The words of the Syrian regime in our judgement are simply not enough," Kerry said. Standing alongside Lavrof, Kerry said that the United States is serious about this proposal, even if the technical difficulties of removing chemical weapons during a civil war are untested. "We do believe there is a way to get this done," Kerry said, right after giving Lavrof a warning that "this is not a game." When it was Lavrof's turn for a statement, he declined, saying President Vladimir Putin's piece in The New York Times speaks for itself. Though the U.S. and its allies say the threat of military force has led Syrian President Bashar Assad to endorse a Russian plan for ceding control of his chemical weapons, the Syrian leader says "U.S. threats did not influence the decision." Russia's RT.com newssite says Assad has told another Russian news channel that "Syria is handing over its chemical weapons under international supervision because of Russia," not any pressure brought by the Obama administration's talk of missile strikes. We reported earlier on Secretary of State John Kerry's arrival in Geneva for talks with his Russian counterpart about the potential diplomatic solution to the chemical weapons crisis. As we wrote, the commander of the Free Syrian Army has told NPR that "the Russian initiative is just a lie."